SpaceX showed off its Crew Dragon capsule and introduced the first four NASA astronauts who will fly in it. CNBC took a closer look at several pieces of hardware at SpaceX headquarters in Hawthorne, California, as well as heard from the four astronauts. Humanity's first privately-launched, crewed space flight is a few steps from happening. SpaceX gave outsiders a glimpse of the vessel that four NASA astronauts will – if all goes according to plan – ride to orbit next year. "We are not going to fly until we're ready to fly these folks safely," SpaceX President and COO Gwynne Shotwell told reporters Monday. She said the company needs "to demonstrate that this vehicle is capable of taking astronauts up from U.S. soil as often as NASA will allow us to do so." Crew Dragon is SpaceX's bid for NASA's competitive Commercial Crew program — the agency's solution to once again launch U.S. astronauts from U.S. soil. SpaceX and Boeing won multibillion dollar contracts in 2014 to build and test the capsules. The development period is coming to a close as SpaceX and Boeing prepare for test flights. Elon Musk's SpaceX anticipates a first flight without crew in November. NASA announced Aug. 3 the assignments for the first nine astronauts riding commercial spacecraft to the International Space Station, naming five to Boeing flights and four to SpaceX flights. A mock-up of Crew Dragon, to show off what the capsule will look like, both inside and out. Now that SpaceX knows who the astronauts are scheduled on the first flights, the company is adjusting the seats and distance from the controls so they can comfortably reach panels and move around. The simulator SpaceX built to test the features and electronics inside Crew Dragon's cockpit. "We're kind of looking to see what works best, what doesn't work as far as crew module design, display design, space suits, all the things that basically an astronaut would touch on a mission, concept of operations, those kinds of things," Hurley said. 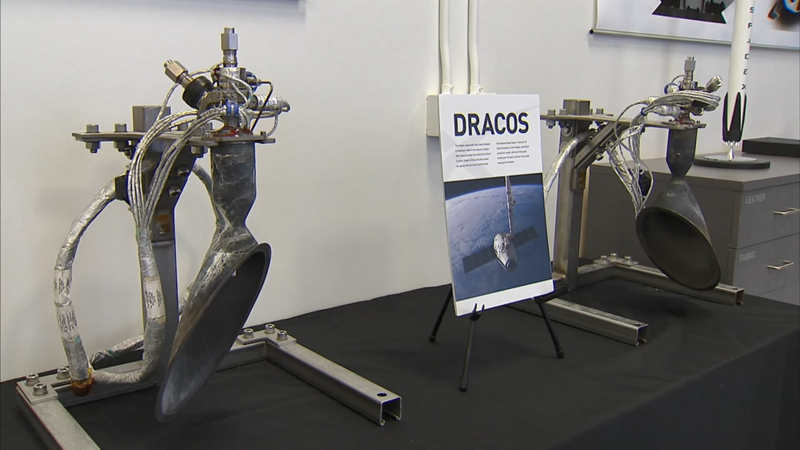 A close-up on the Draco thrusters that the capsule will use to maneuver in space, especially as it positions itself to dock with the ISS. Crew Dragon will have 18 to direct itself in space. While it may look like separate pieces, the spacesuit made of Nomex and Teflon is all one piece and can pressurize in an emergency. "They started from scratch, built it in house and so ... Bob and I have been here since the first space suit was ever designed here," Hurley said, referring to Behnken. "We've had experience wearing all these suits and I think SpaceX looked at all those and tried to improve on some of the things that we complained about. One is that they're really big, really heavy, have a lot of metal in them. Sometimes they're hard to see exactly where you need to see just because of the way the helmets are designed or the visors are designed. And so they took some of those inputs and designed our suit," Hurley said. "Bob and I have probably worn the suit 20 or 30 times already, and they're getting to the point where the suit is about completed with the design. It seems to be much lighter, more comfortable to wear, and the helmet is very light and very comfortable, which is pretty nice," Hurley added. The Crew Dragon simulator where astronauts suit up, put on life support systems and run training simulations. It has four seats, with space left below for cargo or to add three more seats. This simulator is built to be just like the real capsule. Training in it is as close to operating a real Crew Dragon as the astronauts can get before flight. While it may not simulate the weightlessness of space or the gravitational forces of a rocket launch, it does do all the other steps of a flight, including check-ins, docking with the ISS and splashing back down in the ocean. Pictured behind Shotwell is the capsule being prepared for SpaceX's first crewed mission, expected in April. "Whenever we talk about dates we're always confident and then something crops up," Shotwell said. "Predicting launch dates can make a liar out of the best of us. I hope I am not proven to be a liar on this one. We are targeting November for Demo 1 and April for Demo 2." Gwynne Shotwell president and chief operating officer of SpaceX, left, speaks as NASA astronaut Bob Behnken looks on. "I would love to say that this mission is going to be like every other mission, because I want every rocket and every capsule to be reliable, but I can tell you there will be about 7000 extra sets of eyes on the build of this system, the testing of this system and all the interfaces," Shotwell added. When asked about the most fearful part of climbing into the capsule on launch day, the astronauts gave a variety of answers for what came to mind. "I think, for probably most astronauts, is messing up. You don't want to make a mistake," Hopkins said. NASA Astronauts Bob Behnken, Doug Hurley, Mike Hopkins and Victor Glover talk to reporters during a media tour of SpaceX headquarters. "The only thing I'm ever afraid of is not coming home to my family," Glover said. "That was true on deployments ... and that's the same thing I feel now." "The thing that I'm most afraid of is not knowing something that I should know or that if I did know would help us be more successful on the mission — and with a new vehicle that's especially true," Behnken said. "Human space flight was the reason SpaceX was founded in the first place," SpaceX director of crew mission management Benjamin Reed said. "We are here, it's our number one goal, our number one priority." "What I'm looking forward to the most is, it's probably cliche, but the entire experience, because my first week in space will be the first first week in space," Glover said. "The first month in space will be my first first month in space, so everything that I get to do will be the first time I've been able to do it in orbit and so I'm looking forward to the entire ride." "Bob and I both participated in building the space station so ... it's exciting to now go back and see it done and being fully utilized and then just to see how it's changed since the last time we were up there," Hurley said. "I'm really, really hoping that this time I can actually get an hour to sit and look out the window. Because the shuttle missions were choreographed such that you just never had only like a fleeting moment to kind of glance here or you had to stay up way past bedtime to do it and you were too exhausted to do that." SpaceX's bid of $2.6 billion awarded by NASA was substantially below Boeing's. Shotwell said she wishes she "could have bid more after the fact." "But that doesn't change the fact that we're doing this job. I hate to talk about profit when we're talking about flying astronauts, but this will not be a losing proposition for SpaceX," Shotwell said. "I'm very excited about the opportunity to return to station. Having had spent six months up there already to see how it's changed over the past four or five years," Hopkins said. -- CNBC's Jodi Gralnick contributed to this report.